Like many first-time parents, I was totally clueless when I came home with my first baby. I had at least done enough research expect to not get a lot of sleep, but I had no idea what reality would be like. Little did I know our baby would be co sleeping with us! My husband and I had made a beautiful nursery for our little girl, but we also had a bassinet in our room. We figured she would stay in that little crib for a few weeks and then we’d get her used to sleeping in her own room. Ha! The first few weeks weren’t bad. I was still drenched in new-mom hormones, so whenever General Leia woke up to eat (we were feeding on demand like newborns need), I’d dutifully get up, take her to the rocking chair in the corner of our room, feed her, and then put her back in her bassinet. And my husband was good enough to even wake up with me and chat quietly with me to keep me awake! But of course, that pattern didn’t last forever. My husband had to go back to work and couldn’t afford to stay up with me. Our baby wouldn’t fall back asleep on her own! I would bounce her and sway her and do everything I could, but as soon as I put her down she would wake up and fuss. So we had to find a new way to make things work. Enter bed sharing. Disclosure: This article contains affiliate links. You can read my full policy here. How many people really co sleep with their baby? The short answer: More than you’d think, and more people than will admit it. Here’s the deal: whether you exclusively breastfeed, formula feed, or do a combination, your baby is going to be waking up in the night a lot, and you’re going to be desperate for sleep. In fact, some studies show that exclusively breastfeeding mothers actually get more sleep than their formula-feeding counterparts, believe it or not! But we’ve all heard the horror stories and seen the scary ads about SIDS, so we think we’re not “supposed” to sleep with our babies. But we’re so tired, it feels like the only way to survive. So we put our babies in bed with us. Image from Dr. Kendall-Tackett’s article on maternal-child sleep. 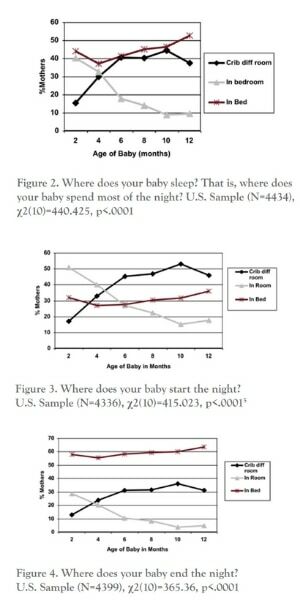 According to the graphs, babies often start the night in their own room or in a crib in their parent’s room. But somewhere in the middle of the night, over half of the babies, regardless of age, end up in bed. We don’t wear seat belts because we plan to crash, we do it just in case. So why don’t we just teach people how to bed share with their babies safely, in case that ends up happening? The big worry, of course, is SIDS. 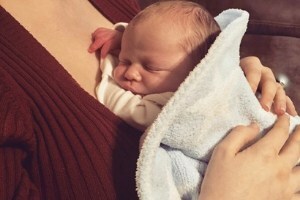 The threat of this tragedy strikes more fear into new parents than perhaps anything else. And we have been taught that bed-sharing can lead to SIDS. Many times, it’s not bedsharing that is associated with this devastating outcome, but co-sleeping on another piece of furniture. For example, sofas and recliners are extremely dangerous to fall asleep on with your baby. Once a parent falls asleep, it is easy for babies to get lodged between cushions and be unable to breathe. The real tragedy of this situation is that mothers who are in an armchair or on a couch with their child probably have no intention of falling asleep there. It’s just so easy to do when you’re so exhausted! So if you need to rest in the night while feeding your baby, you are better off getting in bed with her than getting on a couch or in a chair. Additionally, a bed can be safe, but not if there’s heavy comforters, puffy pillows, or a soft mattress. These articles can obstruct a baby’s airway. And if a parent is influenced by alcohol or drugs that could cause extra drowsiness, they should not be in bed with their baby. In this state, you’re less likely to notice if you roll over on your child. On a similar note, SIDS is more likely when a baby is asleep with other children or a pet. Siblings aren’t as likely to notice a baby and move away in their sleep as a parent is. So don’t leave your children sleeping with their baby sibling. 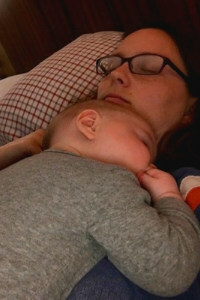 At the same time, there are many benefits of co sleeping with your baby. Assuming you’re breastfeeding, your baby will stir and you can lean over and feed from a side-lying position, still in bed. Then you can both easily go back to sleep. I know “they” tell you to put your baby in her own crib, still drowsy, and let them go to sleep without you, and some babies allow that (Bella Bean was okay with it). But others, like Leia, just won’t have it. You’ll set yourself up for breastfeeding success. On top of that, bedsharing with your baby makes it more likely that you’ll be successful at keeping breastfeeding up. Co sleeping babies spend more time nursing at night (but with less sleep disturbances! ), and the extra suckling helps to ramp up milk supply in mothers. Win-win! And although we hear a lot about SIDS and bedsharing, breastfeeding is one of the best ways to decrease the risk of SIDS. Since co sleeping supports breastfeeding, if it’s done safely, it can actually decrease SIDS risk as well. You’ll get to wake up to your adorable baby. How do you make bedsharing safe? Done incorrectly, yes, bedsharing absolutely can be dangerous. But with the right precautions, it can be a wonderful arrangement for mother and baby. One of the best tools for knowing how to bedshare safely is the “Safe Sleep 7.” This information is put out by La Leche League, an international breastfeeding support group (who also published this book that absolutely made the difference in my successful breastfeeding journey!). I’ll recap here and add my own experience. Whether you do so in bed or out of bed, bedsharing when you’re a smoker is a big no-no. Incidentally, parents who smoke significantly increase their child’s risk of SIDS, as well as a whole host of future problems for their child. If this is something you struggle with, get help. Even when you’re asleep, you’re aware of your environment. After all, you almost never roll off the bed, right? But this awareness is impaired when you’re intoxicated. So don’t drink and then co sleep. 3. Exclusively breastfeeding is better. Breastfeeding is protective of SIDS. On top of that, some studies have shown that women who breastfeed their babies tend to “cuddle-curl” up around them and wrap their arm above them, thereby blocking the baby’s head from pillows (Unfortunately, I don’t have any pictures of myself doing this, because, you know, I was asleep, but here’s a link showing exactly what I’m talking about with the cuddle-curl). Formula feeding babies, on the other hand, tend to sleep with their head up at pillow height, where there is more danger of smothering. So it’s strongly suggested that only exclusively breastfeeding babies bedshare. At the same time, the logic from before still stands. Regardless of feeding method, if you have to get up in the middle of the night with your baby, you’re safer taking him to bed with you than going to a couch or recliner! 4. Your baby should be healthy and not a premie. Especially small babies should not bed share. 5. Your baby should sleep on his back. This tends to happen naturally with bedsharing, breastfeeding babies. They may roll towards you, onto their side, to nurse, and after getting done they’ll roll back onto their back. Alternatively, they may stay on their side towards you. That’s okay too. 6. Your baby shouldn’t be allowed to overheat. Being too warm (to the point of sweatiness) is another risk factor for SIDS. If you think your baby is going to have your top sheet over her, he shouldn’t have very heavy jammies on (you shouldn’t have any heavier blankets over her). Otherwise, a thinner sleepsack will do the trick. Side note since we’re discussing sleepsacks here: Don’t swaddle your baby if you’re bed sharing! Those little arms are helpful for alerting you to her presence, so let them stay out. I loved having sleepsacks for all three of mine (especially for naps when I wasn’t in bed with them), but you just have to make sure to undo the swaddle once you bring them into your bed. 7. Have a safe surface for your baby to sleep on. Avoiding sofas and recliners is only the first part of having a safe sleep surface. You need to have a firm mattress that doesn’t allow your baby to sink in. In addition, you need to make sure the baby can’t roll off into the floor or get wedged somewhere unsafely. Some people choose to simply forego a bedframe and just have their mattress on the ground while cosleeping. Others have the bed directly against the wall (but you have to make sure there’s no gaps between the mattress and the wall). As I mentioned at the beginning, we had a nursery set up for General Leia’s arrival. When we had our second and third children, though, we didn’t bother. We knew those babies would be in our room! Once we wised up, we chose to sidecar Leia’s crib to our bed. (I love the design of this one. It wasn’t available for our kids, but it’s adjustable to come up exactly to the height of your bed and fit directly against your mattress. This would have made my life so much easier if we had just gotten it instead of a fancy traditional crib). The sidecar made sure the baby couldn’t roll into the floor. Plus, when she was really tiny and fussed to eat, I could lean over into her crib (weird, but true! ), feed her, and then pull away and go back to sleep in my bed. No one had to get up, but she still had her own sleep space. And as she got older (bedsharing risk decreases even further after three months), I had the choice of whether she would be in her little sidecar crib or directly beside me. If you choose to have your baby directly in bed, you also need to make sure her head is kept clear of pillows. Ideally, you are told to just not use pillows at all. Full disclosure, I have a fairly firm (not billowy) pillow that I use, and between it’s shape and my cuddle-curl position I never had an issue with my babies getting too close to my pillow. But that’s up to you. Are you looking for a supportive community? Join our free Facebook group at Evidence-Based Parents! You’ll be surrounded by other parents who are either going through the same experiences as you or who have come through the other side, read to help those following. We look forward to seeing you there! Is co sleeping or bedsharing for you? I hope this post has given you a lot to think about concerning the advantages of bedsharing, as well as how to do it safely. Let me know in the comments if you have any questions, and Happy Parenting! Great post! So thorough! I’m not a parent but I have heard parents express their concern with SIDS. 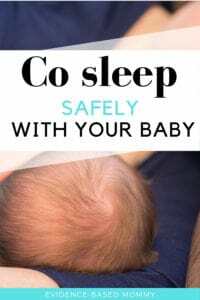 I think many parents will benefit from this post; allowing them to get more sleep and alleviate their concerns of sleeping in the same bed with their babies. Thank you! Thank you so much Roger! You’re right, so many people are terrified at the thought of SIDS (how could you not be?). But there are definitely ways to keep your child safe while still getting the sleep you need. You wrote a great article! I’m sure it will be really helpful for new parents. Please keep it up. And keep giving us awesome articles like this. God bless you.